I have had really bad luck selecting internal card readers over the years. I use a SLR camera that still uses the CF type of memory card. The internal card readers that I have used over the years require a precision hand when inserting the card if you don’t want bent pins. My Rosewill reader finally decided to have a mind of it’s own and was so flaky I never knew when it was going to work. It would keep telling Windows it was there and then not there. It recently went into a loop and the dinging noise from Windows seeing and not seeing the reader drove me crazy and I finally sent the reader to the trash bin. I read all the reviews for my next card reader. I was not going to get another Rosewill product. I went with a company called Nippon Labs. Their card reader is the first where I don’t need to insert my CF card and pretend I am doing heart surgery. The SD and CF slots fit the memory cards perfectly. The one I selected also has an eSATA and USB port. They even include the SATA cable. 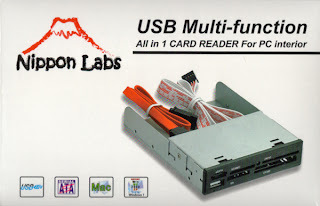 The card reader connects to any onboard USB header. Most M/B’s have several of these and installation is easy. This reader goes for about $20.